Staff members have been enjoying morning teas and dressing in casual dress recently to raise money to sponsor Luke Hallam, who is competing in Paddle 4 Autism later in the year. Paddle 4 Autism is a stand up paddle board race in Hawaii which has been organised to raise money for the early intervention unit at the Autism Association of WA. We wish Luke the best of luck in the race and thank him for his contribution towards this cause. We entered a team into the Law Society’s Young Lawyer’s quiz night last month and achieved 2nd place out of 28 tables. It was an enjoyable, if not stressful, evening in the face of hot competition. Thank you to Nicola Watts for being the driver and ensuring each member of our team was skilled up and ready to go. We held morning a tea every Friday for 2 months to raise money for the Bush Fire Appeal. We enjoyed a wide variety of food cooked by staff members and were able to raise $540.00 to donate towards this worthwhile charity. Paterson & Dowding recently celebrated the milestone with our senior partner Lucy Thomas when she turned 50. Current and former staff members gathered in the boardroom for a night of lively fun. Lucy regaled us with some stories of her journey to 50. We congratulate Lucy on her 50th Birthday and look forward to celebrating many more with her in the future. 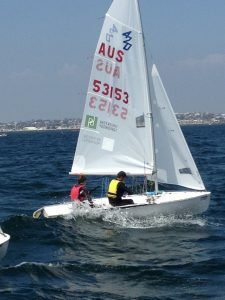 Paterson & Dowding is proud to sponsor Oliver Marshall, Tom Sproul and Callum O’Brien from the Claremont Yacht Club racing in Red Witch, and Adam Brenz’ Verca and Digby Taylor from the South of Perth Yatch Club in Rampage. Oliver, Tom and Callum race on a Saturday afternoon, and Adam and Digby will be travelling to Victoria in January 2014 to compete in the National Championship followed by the Youth Championships.